Published in the Dover Express, 28 November, 1980. In 1846 electricity was in practical use for telegraphing messages between London and Dover, and in 1851 between Dover and Calais. The submarine cable between Dover and Calais was the first in the world, its completion, on 25th September, 1851, being regarded as an event of international importance. The first submarine message was to Queen Victoria, and the second to the Duke of Wellington, Lord Warden of the Cinque Ports. The first practical use of electricity for lighting purposes in this neighbourhood was on the 1st of January, 1872, when the South Foreland Lighthouses were illuminated by that agency, the light source providing 150,000 candle power. Prior to this there was a trial in 1858 of “magnetic electric“ machines invented by a Mr Holmes. It would appear that these were not very successful. Before this the light source was sperm oil lamps and two reflectors, magnifying lenses not being incorporated until 1810. When electricity was successfully Installed in 1872 the staff consisted of one engineer and six keepers who were paid about 20p a day. It was near the lighthouses that Marconi carried out some of his first experiments in radio telegraphy in England, in the mid-1890s. Wireless telegraphy was first employed as a means of communication between lightships and the shore in 1898 with installations at the South Foreland lighthouse and on the East Goodwin lightship which were 12 miles apart. The great value of wireless was demonstrated for the first time when, on 3rd March, 1899, the ill-fated lightship was run down by a steamer. The accident was immediately reported by wireless to South Foreland and lifeboats were promptly launched to rescue the lightshipmen. In March 1898 Marconi established communication between England and France. The Dover Town Council first began to talk of lighting the streets of the town by electricity in 1882, a step which was advocated by Mr Thomas Viney Brown, a leather merchant, who was mayor in 1884. He was full of enthusiasm about it for a while but, after he had attended a meeting of the Municipal Corporations Association, where it) was stated, on high authority, that the cost of an Installation to light a quarter of a square mile would not be less than £100,000, he persuaded the Corporation not to proceed with the application for an Electric Light Provisional Order, which he had previously proposed. In December, 1888, the Town Council again approached the subject, and It was resolved to apply for a Provisional Order, not because It was then believed that the Corporation could produce electric light at a price that would compete with gas, but it was feared that if the Corporation did not secure the monopoly, a private company would. The power then obtained, for some years lay dormant, but it ultimately became necessary for the Corporation to use their Provisional Order, or let it lapse; and after consulting experts, who held out but little hope of Municipal works being run at a profit, in December, 1893, the Corporation sold their powers to the Dover Electricity Supply Company. The Dover Electricity Company established their generating station on a central piece of land, a portion of the old Maison Dieu Park, in Park Street, which had some twelve years previously been converted into lawn tennis courts. This local company had the Brush Electricity Company of London, at their back with all their experience and technical knowledge. The Company was formed in 1894, but did not begin to make a profit until 1897. From that date the profits steadily Increased. In the meantime, the Corporation had introduced its electric tramway system and it having been demonstrated that both for light and power there would be continually growing demand for electric current, it was proposed that the electricity supply should be acquired by the Corporation. After protracted negotiations and in the face of considerable local opposition an agreement to purchase was reached in March 1902, for £142,228. An Act of Parliament was needed to conclude the transfer and before this was passed a poll of the town was taken- This was one of the last held under the open voting system, a ballot for such polls being introduced a year later. The transfer was eventually made in accordance with the agreement, in May 1904, with financial results which proved that the municipalisation of electricity was a step wisely taken. Travelling in opposite directions two Dover trams, which saw service on the River route 46 years ago, meet on the passing loop at Buckland Bridge. With Ashdown’s monumental masons business on one side, and a pavement sharing the space between the parapets with two tramlines, the bridge was more of a bottleneck then than it is today. The photograph was taken in the summer of 1934. It was used in the Dover Express to illustrate the congestion which could be caused to traffic, which had grown beyond all expectations since the tramway was opened in 1897 and since the time when it was decided to site a passing loop partly on the narrow bridge. Cars were practically non-existent in the town at that time. The extension to River—then little developed—was opened with great ceremony on 2nd October, 1905, bv the MP for Dover, the Hon George Wyndham. 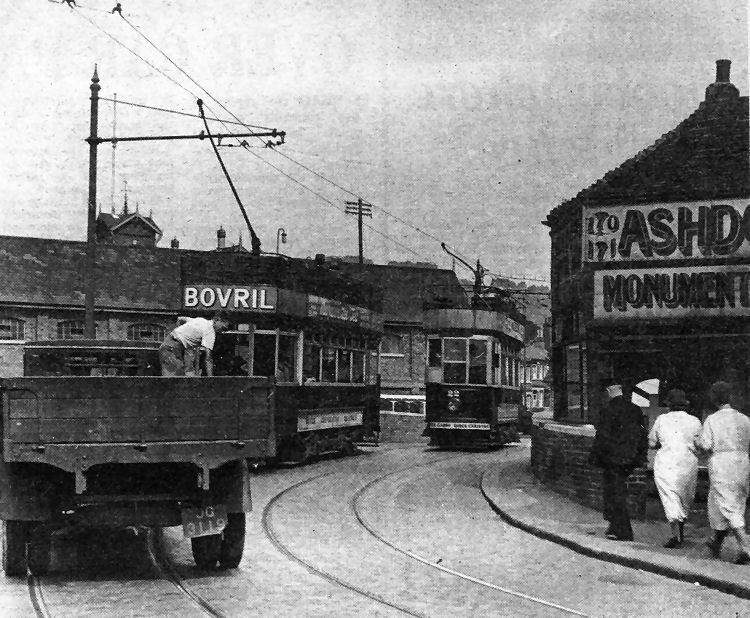 Pictured above is the Dover to Buckland horse-drawn bus, with passengers, returning towards the town centre about a century ago. 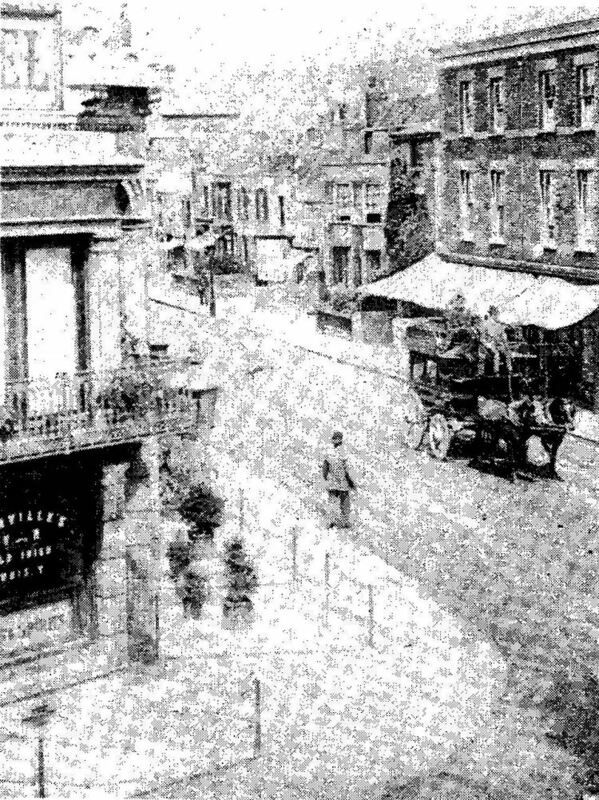 On the left is the Eagle Hotel and opposite is what is now Turnpenny the furnishers.